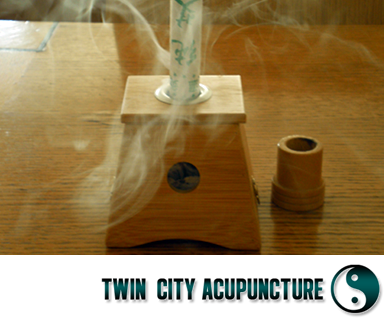 Moxibustion is a method of burning Chinese herbs (mainly one herb named "AI") around the acu-points. It creates a warm sensation and enhances the treatment effects. Moxibustion is a very important treating method of Traditional Chinese Medicine. Comparing with other treating methods, Moxibustion is safer and much more comfortable. TCM believes that some diseases can be easier to cure when Moxibustion is performed during Acupuncture or Herb treatment. Many Chinese herbs can be used to do Moxibustion, but we mainly use "AI". In authoritative TCM ancient works, it says: "AI is bitter, slightly warm, has no side effect, and is good for doing Moxibustion to treat hundreds diseases." Some diseases can be cured by Moxibustion alone, such as: chronic diarrhea, long time sensitive to cold, etc. But this traditional, safe, comfortable treatment is difficult to be found in many clinics nowadays. Why? Because Moxibustion takes time and patience. First, it takes time and patience on the patient's part. Moxibustion is comfortable but is a mild treatment, so it takes longer time than acupuncture to cure some diseases. Additionally, it takes time and patience on the Acupuncturist's part. During the whole treatment, the acupuncturist stays with patient to observe and to change the moxa cone on time. The number of cones determines the number of times the cones need to be changed. For example, there is an ancient treatment named "nine cones Moxibustion," which means the acupuncturist should change moxa cones nine times during the patient's treatment. Moxibustion is the best treatment for chronic diseases with cold sensation.